OFFICIALLY ON THE JOB – Members of the new city council are seen in council chambers after being sworn in Monday evening. Left to right are councillors Rob Fendrick, Betty Irwin and Samson Hartland, Mayor Dan Curtis, and councillors Jocelyn Curteanu, Dan Boyd and Roslyn Woodcock. The city’s new council is now officially on the job. During a short ceremony and meeting inside council chambers Monday evening, members elected a little more than a week ago were sworn-in to their new roles and tasked with working to make the city a better place. Mayor Dan Curtis and councillors Betty Irwin and Jocelyn Curteanu were returned to their roles from the 2012 to 2015 term in the Oct. 15 election. Roslyn Woodcock, Dan Boyd, Samson Hartland and Rob Fendrick round out council. “I think I have the dream team,” Curtis said in his speech following the ceremony. The event began with three members of the Whitehorse Fire Department marching into council chambers in formal uniform, carrying ceremonial axes. Pat Ross, who works by day as the city’s planning manager, was on bagpipe duty, piping the new council into chambers. As Curtis, Woodcock, Boyd, Curteanu, Hartland, Irwin and Fendrick walked in, cameras and smart phones began clicking by the many family and friends who had filled the gallery to take in the ceremony. Also in the gallery was Premier Darrell Pasloski, members of his cabinet and Liberal Leader Sandy Silver. Emcee Jeff O’Farrell, the city’s manager of legislative services, welcomed those gathered and introduced the incoming council. Valerie Anderson, the city’s manager of financial services, also took on a different role for the event as justice of the peace. She called up each member individually to swear or affirm they can and will lawfully fulfill their roles on council. As a group, the seven members then swore the Oath of Allegiance and the Oath of Athens before formally signing off on their new roles and standing behind their new seats at the council table. As O’Farrell presented the council, applause erupted in the gallery. The sound of clicking cameras continued as members took their seats and the firefighters marched out of chambers. Curtis then addressed the crowd, first acknowledging the city is on the traditional territory of the Kwanlin Dün First Nation and Ta’an Kwach’an Council. As the mayor spoke of the future, he reflected on the past term, noting the work of the incoming council will be a continuum of the work done by the previous council, as has also been case for the outgoing council. He highlighted a number of successes over the last three years, from major increases in transit ridership to the rise in waste diversion and an improved relationship with First Nations governments. Those successes happened over the last three years, but Curtis remained clear they were the result of work by many past councils over the years. He praised now former councillor Dave Stockdale, who had served 11 consecutive terms – more than three decades – and his role in those efforts. Stockdale placed seventh in the election, one spot away from the final sixth seat on council that went to Hartland. Over the years, Stockdale made significant contributions to the city, Curtis said. He went on to thank John Streicker and Mike Gladish for their work as councillors over the last three years. Both opted not to run in this year’s election, but were seated in the gallery last night. Experience continued to be a major highlight in Curtis’ speech as he welcomed the remaining members of council. The city is very fortunate to have the experience of two former councillors who served “almost in a different era,” he said. He was referring to Boyd, who was a councillor from 1994 to 2000, and Hartland, who served on council from 2000 to 2003. Fendrick, meanwhile, brings 17 years of corporate knowledge to council and a love for the city, the mayor said. Fendrick was the city’s director of corporate services – having worked for the city for nearly two decades – before he was fired without cause earlier this year by city manager Christine Smith. In past interviews, he’s said he’s focused on beginning a new chapter of his life as a councillor and ready to work on a number of initiatives he hopes to see come to fruition. Curtis noted many of Woodcock’s values line up with the city’s. Woodcock is the only member of the current council who hasn’t spent a significant amount time at city hall either on a previous council or as city staff. The consultant, however, holds a degree in city planning and has a certificate in public administration. Curtis pointed out that many have made note of the new council including three women. However, a number of women have contributed to past councils in many ways, with the city having had a number of female mayors over the years, he said. The city’s first female mayor, Ione Christensen, was seated in the gallery last night. The mayor then went on to note the many female leaders who are in or have been elected to other governments in the territory, such as the chiefs of the Kwanlin Dün First Nation and Ta’an Kwach’an Council. 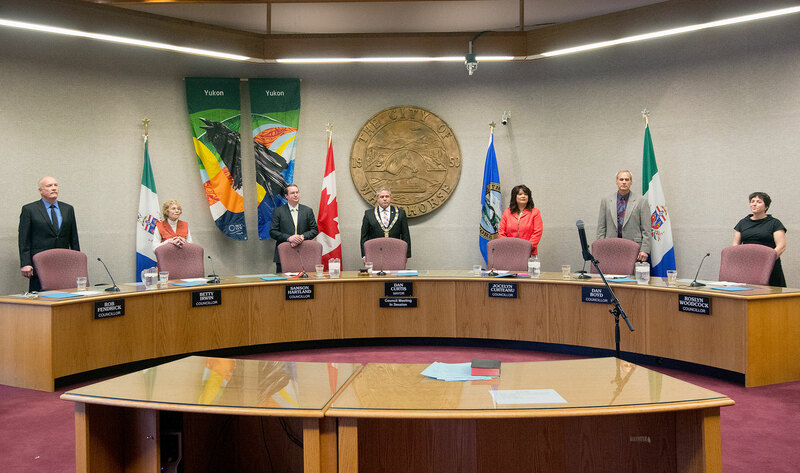 Curtis stated his belief that Whitehorse has “the best council for our community” and noted this council will continue to work to make the city the best place to live. “Our marching orders come from you,” he told citizens as he cited plans to continue the monthly town halls established three years ago. In an interview following the meeting, Woodcock said she’s pleased to officially be sworn-in to office. While she enjoyed the “bit of pomp and circumstance” in the ceremony, she added, she’s anxious to now get to work. “I’m very excited to get going,” Woodcock said, acknowledging much of her experience is acedemic and her desire to turn that knowledge into action. She said a legislative workshop to get to know council’s roles and a bit of a field trip last Saturday have allowed members to start working together before the formal meetings begin. Saturday saw council visit the city’s newest major subdivision of Whistle Bend, the waste facility and the Municipal Services Building downtown. “We’re hitting the ground running,” Curtis said in an interview following the ceremony. In addition to taking in information on how the city runs, its facilities and so on, members were tasked with deciding the seating arrangement at the council table in chambers and just who would chair which committees. They opted for a different approach than usual on each. While the mayor sits in the middle seat at the council table, the other seats are up for grabs, with each councillor also chairing and vice-chairing the various city committees that deal with issues. This time around, members opted to move to a bit of a lottery system rather than giving the incumbents the first choice in each. That meant numbers were drawn to select their seats and committees. In the end, the seats selected will see Fendrick, Irwin, Hartland, Curtis, Curteanu, Boyd and Woodcock seated from left to right inside chambers. Woodcock said she was happy to select a seat on the right end, joking she had heard sitting closer to the mayor may mean a little more camera time than she wants. So, when given the option, she chose an end seat. Before the meeting adjourned, the new council also took its first vote. It unanimously agreed after the earlier discussion and lottery on the appointments for committee chairs and vice-chairs as well as of deputy and deputy reserve mayors over the next year. Under that vote, Woodcock will chair the operations committee while serving as vice-chair of corporate services. She will take on the title of deputy mayor in January and February and reserve deputy mayor from May to October. Hartland will chair the community services committee, while also serving as vice-chair of the planning committee. Council opted to have him take on the first two-month stint as deputy mayor, which will continue until the end of December. Fendrick will chair the planning committee, be vice-chair of the public health and safety committee and be in the role of acting mayor in May and June. Irwin will chair the development services committee, be vice-chair of the operations committee and serve as acting mayor in July and August. She was also chosen to serve as the reserve deputy mayor for the next six months. Boyd is set to chair the corporate services committee while serving as vice-chair for development services and deputy mayor next September and October. Finally, Curteanu will chair public health and safety while taking on the vice-chair role for the community services committee and serving as deputy mayor in March and April. Council reviews and assigns the roles on an annual basis. Just as long as they are not all dreaming on my tax dollars. There is some real experienced people on this council that will keep the mayor in check. I wonder about Dan Curtis' excitement if Rob Fendrick would have been a mayoral candidate in the election instead of running for city council. Yep, just thinking. If the 'dream team' can keep from jacking up the taxes, put away personal agendas for the good of the community, stay away approving things that are going to cost us millions in the long run, stay away from secret deals and backroom agreements.. always be honest with the electorate.. then you should do really well. I hope you will be a council I am proud of. Good Luck.